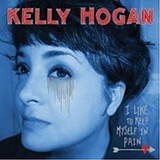 Without any affectations, Georgia-born, Chicago-based singer Kelly Hogan belongs to a continuum of American singers that includes Dean Martin, Dinah Washington, Charlie Rich, Ray Charles, and Dusty Springfield. What these vocal icons had in common was versatility: They could sing any song, in any mood, at any tempo, and entirely ignore genre barriers. "Style" wasn't nearly as important as singing a good song well, and Hogan does this so damn well it's almost intimidating. Her singing has echoes of Springfield (especially) and Patsy Cline, and stylistically, I Like to Keep Myself in Pain is country-soul in the modes of Charles, Rich, Mavis Staples, and Candi Staton. It's a superlative mix of Southern lilt, gospel testifying, and R&B rasp, with just the right touch of top-shelf, pop-oriented polish (but not so much of the latter as to become generic). Overall, the music is restrained but lush at the same time, thanks to multi-instrumental whiz-kid Scott Ligon and king of keyboards Booker T. Jones (he of the MGs). "Sleeper Awake" sounds like a 1974 country-pop hit, and the Tammy Wynette-goes-to-Memphis "I Guess We Can't Have Nice Things" is a harrowing slice of heartbreak and resignation.